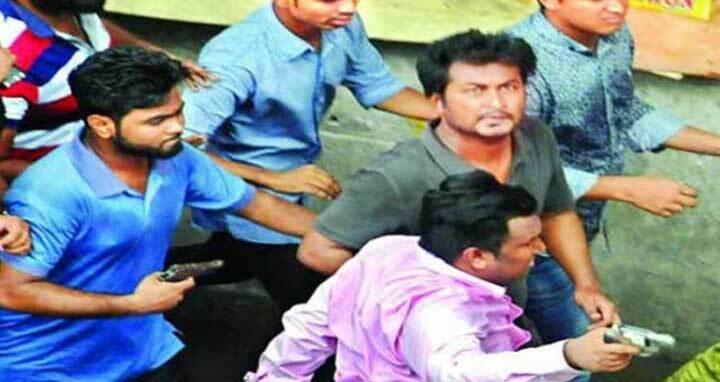 Dhaka, 15 April, Abnews: The charge sheet accusing two expelled leaders of Bangladesh Chhatra League (BCL) in a case filed over brandishing firearms during a hawker eviction drive in Gulistan area of the capital was placed before a court here on Sunday. The two charge sheeted accused are BCL Dhaka south city unit general secretary Sabbir Hossain and Wari unit general secretary Ashiqur Rahman. Earlier on Wednesday, Sub-inspector Akram Hossain of Shahbagh Police Station, also the investigation officer of the case, submitted the charge sheet to Dhaka Chief Metropolitan Magistrate court, said court GRO Mahmudul Hasan. On October 27, 2016, hundreds of hawkers locked into a clash with police after a team of Dhaka South City Corporation (DSCC) officials, led by an executive magistrate, tried to carry out an eviction drive against illegal structures in Gulistan area. The picture of Sabbir and Ashiqur brandishing guns during the clash appeared in the media the next day. However, immediately after the incident, the two accused leaders were expelled by the ruling party's student affiliate.